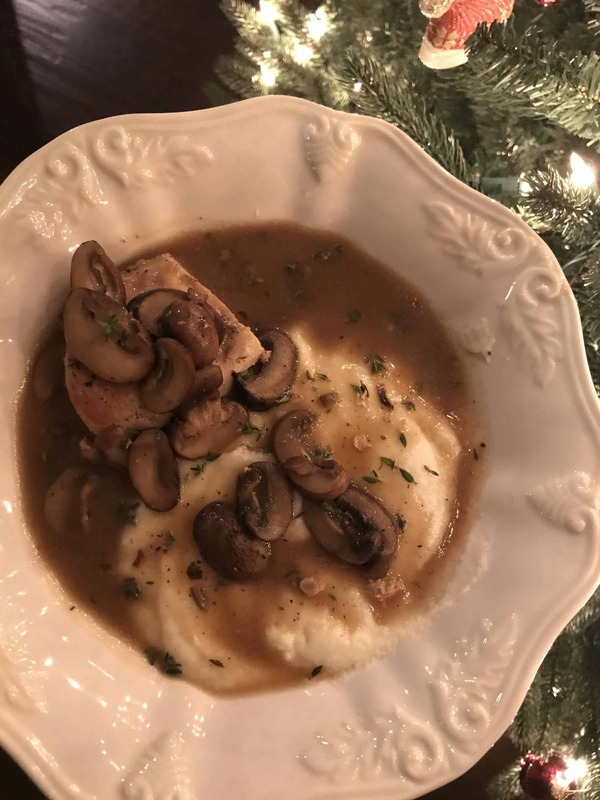 Chicken Marsala has to be one of those dishes that epitomizes comfort food. It’s hearty, creamy, savory, and best of all for you and me: it’s so simple to make! This recipe makes 4 good-sized servings that come in at about 330 calories. Jon Boy opted to have a little more chicken than I did, but that’s totally fine when the meal is already pretty healthy. The flavors in this dish make you think it’s completely luxurious and definitely not under 500 calories! Here are a few of the players in this Marsala Game. Marsala wine can be found at your regular grocery store. I usually find it near the oils + vinegars. 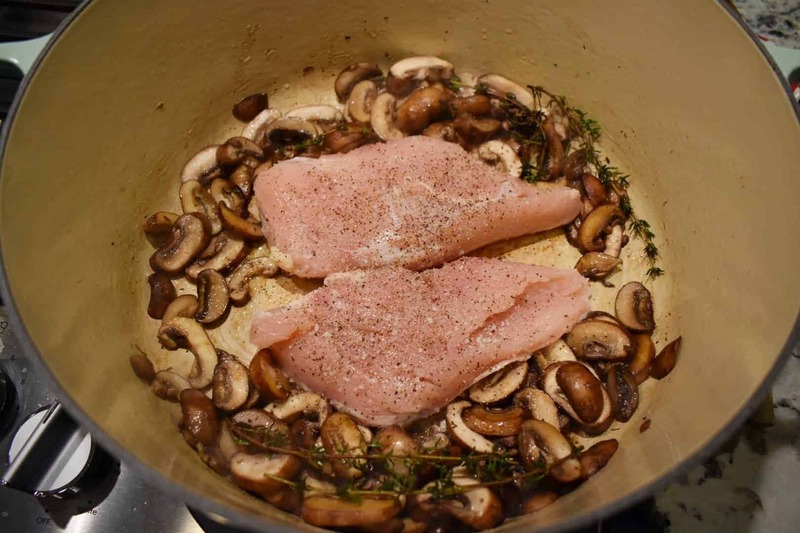 I really love to make this dish with shiitake mushrooms, but our local store doesn’t have them. I went with Baby Bella mushrooms and it worked out just dandy anyways. 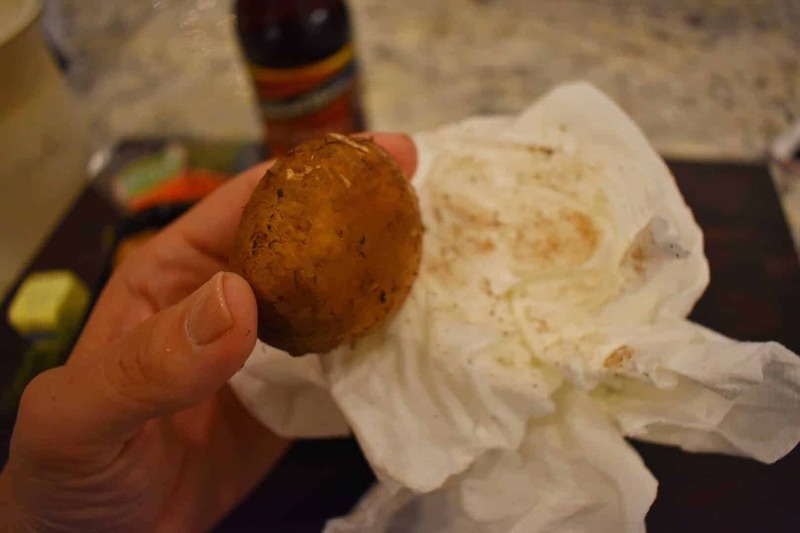 I’ve heard a dozen times on the millions of cooking shows that I watch that you should NEVER wash your mushrooms in water. It makes them get ‘spongy’ according to all those fancy chef-y people. I just use a dry paper towel to wipe off the caps, then I wiggle out the stems, and we’re good to go! I’ve done this for years, and I’m still standing. 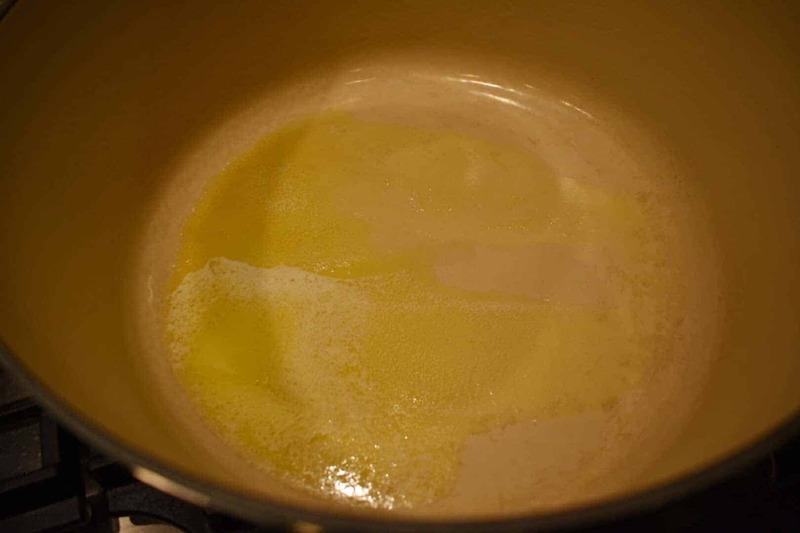 First, melt EVOO (olive oil) + unsalted butter in a biggo Dutch oven or skillet over medium-high heat. 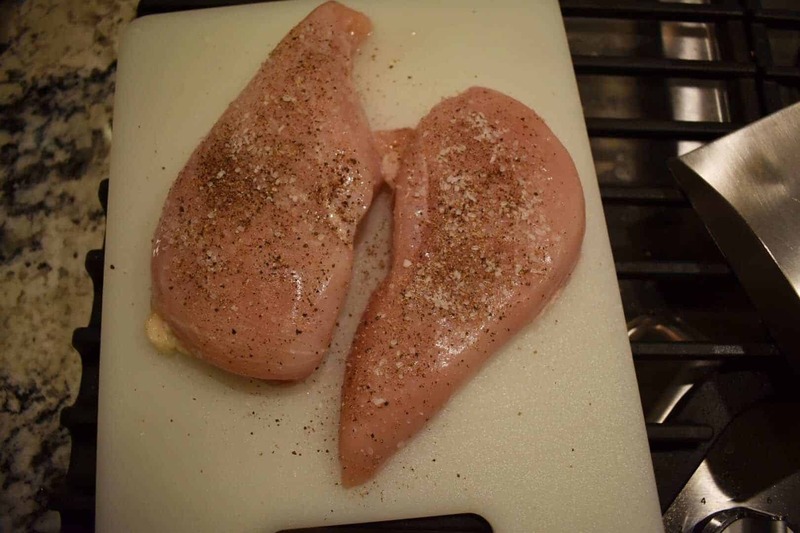 Liberally* season both sides of your chicken with Kosher salt + black pepper. * This is the only time I season this dish, so I tend to make it rain at this point. 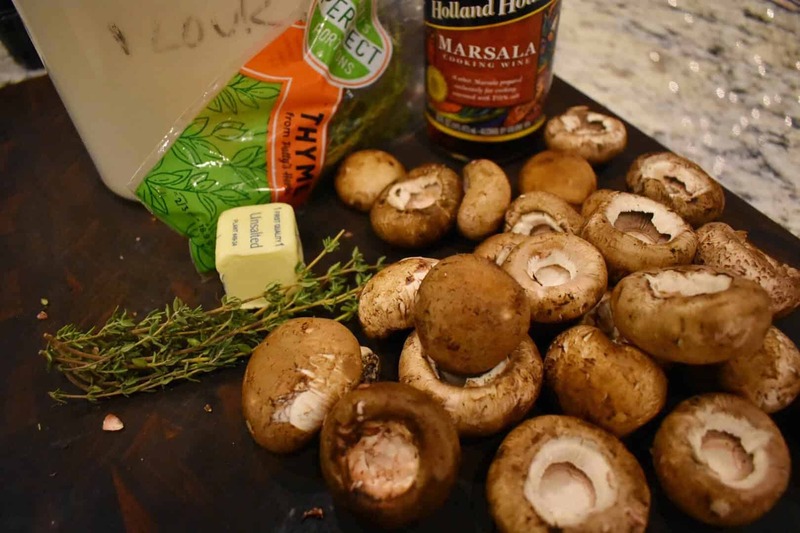 Once the EVOO + butter are warm, toss in your sliced mushrooms and thyme sprigs. 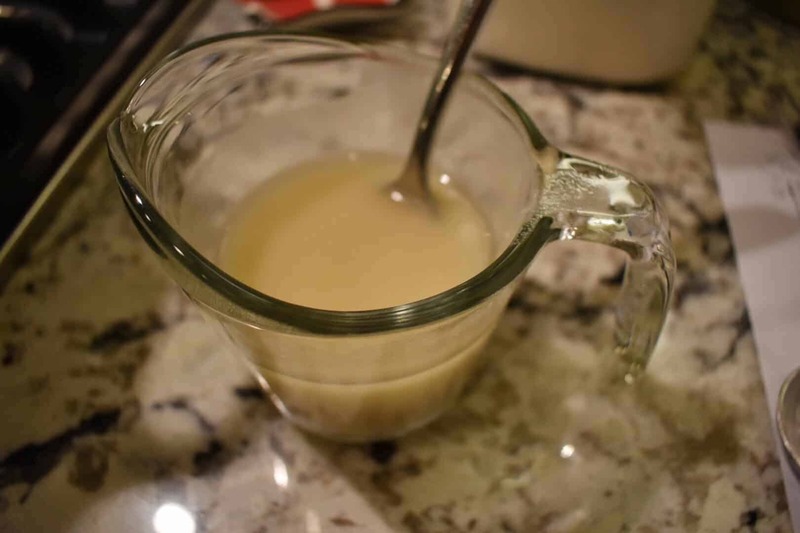 Meanwhile, whisk together some flour + chicken broth to make a slurry that will thicken our yummy sauce. 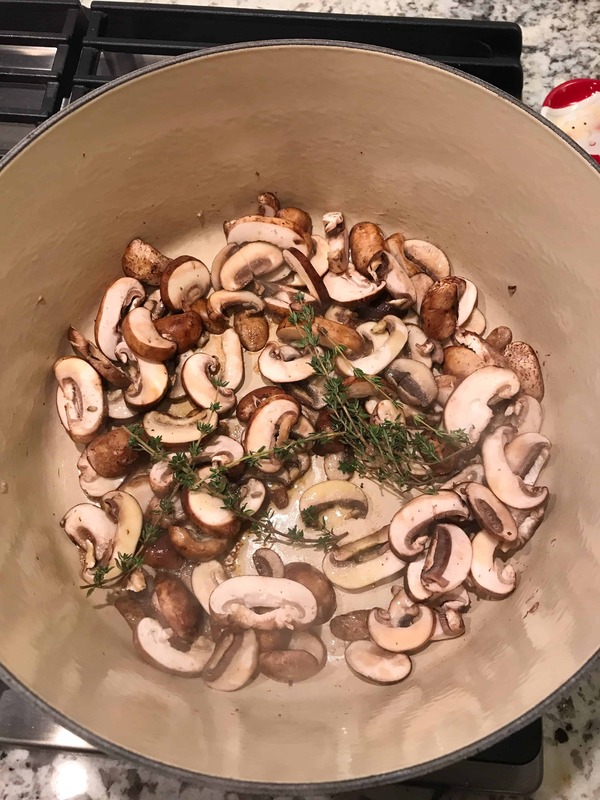 Sauté the mushrooms + thyme until the mushrooms are tender (about 5 minutes). Then, make a ‘well’ in the middle of the mushrooms. Nestle in your little chickens. Let them cook on each side until they’re browned (about 3 minutes per side). 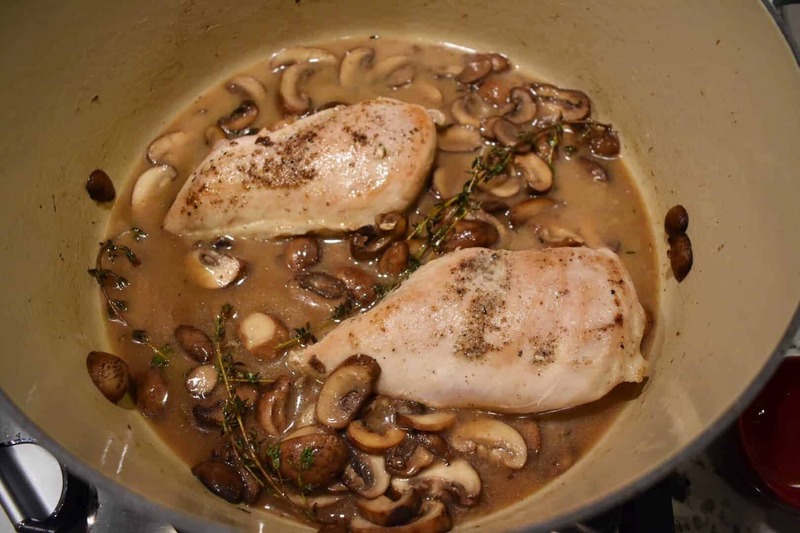 Once the chicken is browned on both sides, pour in the Marsala wine to deglaze the pan. Make sure to scrape the bottom of the pan with a wooden (or plastic) spoon to get up all of the fond (yummy brown stuff at the bottom of the pot). 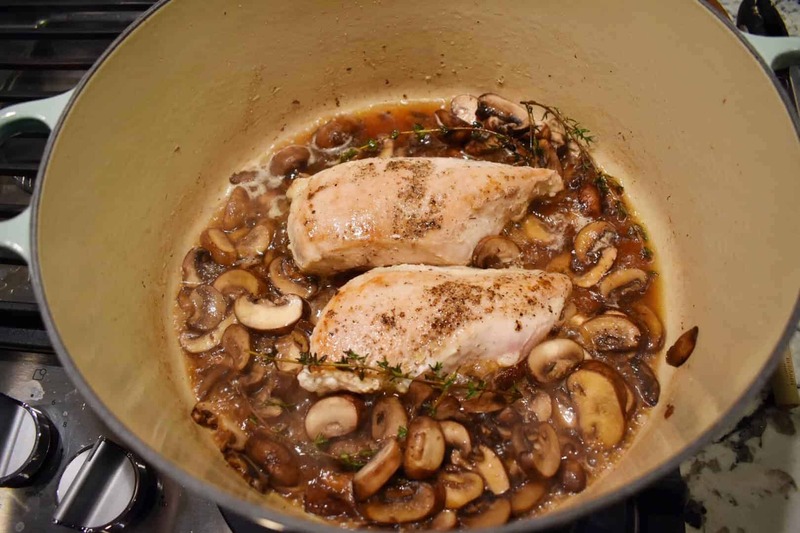 Pour in the flour + chicken broth mixture, lower the heat to medium-low, cover, and cook until sauce has thickened and chicken is cooked through (about 15 minutes). 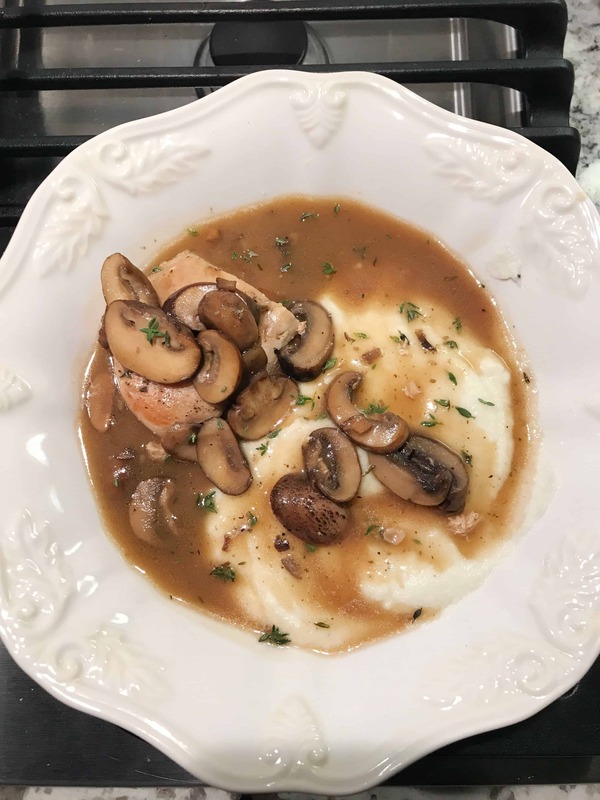 We had our Chicken Marsala with some Cauliflower Mash leftover from the night before. I always make a double batch of the Mash because it’s so yummy + it freezes perfectly. Work smarter, not harder, ‘m I right? You could also serve this with buttered egg noodles, zucchini noodles (zoodles), or pasta. Garnish with extra thyme. In a large skillet or Dutch oven over medium-high heat, melt 2 tbs. butter and 2 tbs. EVOO. 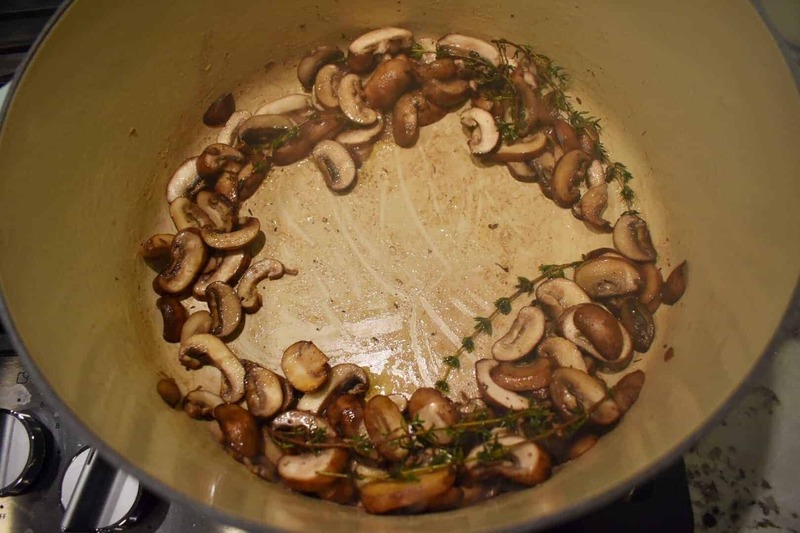 Add mushrooms and thyme sprigs; sauté until mushrooms are softened (about 5 minutes). Meanwhile, season both sides of chicken liberally with salt and pepper. Make a well in the middle of the Dutch oven, add the chicken, and brown on both sides (about 3 minutes per side). 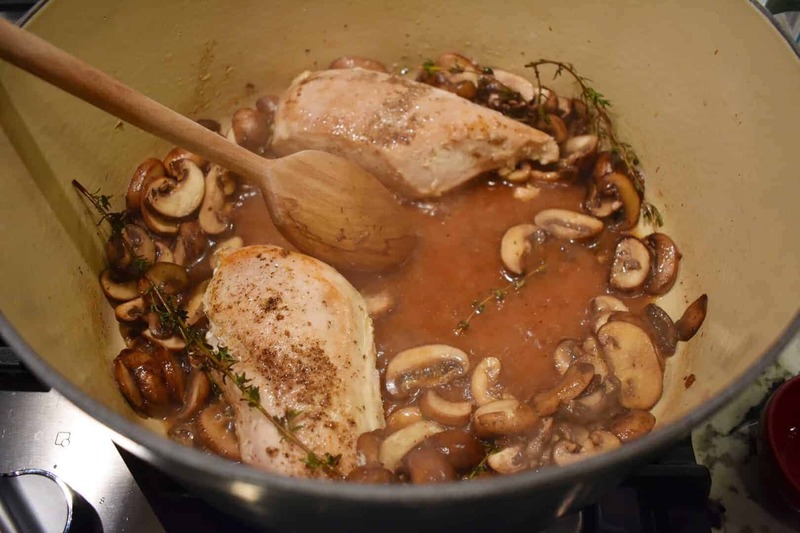 Pour in the Marsala wine to deglaze the pan. Scrape the bottom with a wooden spoon to get all of the fond (brown stuff) off the bottom. In a separate bowl, whisk flour and chicken broth until combined. Add mixture to pot, lower the heat to medium-low, cover, and cook until sauce has thickened and chicken is cooked through (about 15 minutes). Discard thyme sprigs. Garnish with fresh flat-leaf parsley or more thyme. Serve with mashed potatoes, cauliflower mash, or egg noodles.